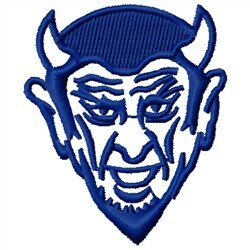 This design is perfect for Blue Devil mascot logos. Great for school spirit attire and accessories on hats, sweatshirts, and more. Embroidery Stitches is happy to present Blue Devil machine embroidery design which has 4269 stitches and is [42.93 mm x 51.05 mm] large. If you would like to view more embroidery patterns please search on our embroidery designs page.